One of Wales' most famous rugby clubs has unveiled plans to upgrade its ground after deciding not to relocate. Pontypool RFC had threatened to leave Pontypool Park, after being hit by vandalism and arson in recent years. The club now plans to refurbish the grandstand and install fencing after a park covenant preventing enclosure of the rugby facilities was amended. Chief executive Ben Jeffreys pledged to make Pontypool Park "a premier sporting venue for the whole community". Pontypool Park has been home since 1945 to Pontypool RFC - one of Welsh rugby's most feared teams in the 1970s and 1980s - and regularly hosted matches featuring the visiting All Blacks, Australia and South Africa. But security has recently been an issue at the ground, which sits in a 150-acre (60 hectare) public park. Protective fencing was not permitted under an agreement struck in 1920, when the former grounds of 18th Century ironmaster John Hanbury passed into public ownership. Last July the club said it planned to leave Pontypool Park after negotiations with Torfaen County Borough Council about the restrictions broke down. But fresh talks led to a deal being struck in January to amend the covenant, according to the Local Democracy Reporting Service. Now, the club is asking the council for permission to enclose the north terrace, pitch and main spectator stand with fencing. A renovated grandstand, with new seating, side screens, a replacement scoreboard and new player dugouts, is also planned. 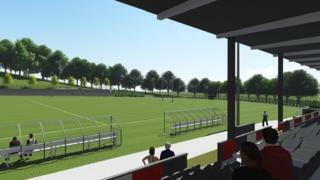 Mr Jeffreys said the application was "a key component to securing the club's long-term future at Pontypool Park". "The planning application demonstrates our desire to make Pontypool Park a premier sporting venue for the whole community to enjoy," he said. "It is our hope that we can bring about much-needed improvements to the ground, but this can only be achieved if the plans are approved."